It was the mother of all side eyes, and it happened at the most opportune time. 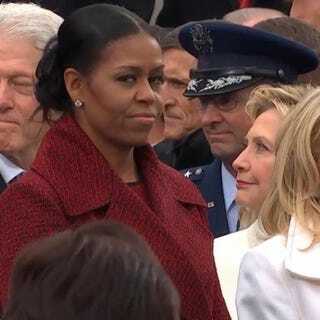 During President Donald Trump’s inauguration, Michelle Obama’s facial expressions immediately became the stuff memes are made of, but unfortunately, shade was not involved. During a speaking engagement Monday at the American Institute of Architects convention, the former first lady said that she wasn’t trying to shade the incoming first family of idiots. Obama said that what was mistaken for shade was just her trying to hold it together as Sasha and Malia took their last walk through the White House. “That moment of transition, right before the doors opened and we welcomed in the new family,” Obama explained, “our kids were leaving out the back door in tears, saying goodbye to people. “I didn’t want to have tears in my eyes because people would swear I was crying because of the new president,” Obama added. All of our shade dreams have now been deferred.